The Fairy Liquid bottle was washed up on Brean Beach during last week's high tides. Up to 400 tonnes of rubbish ended up on the beach. 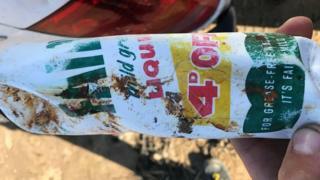 Burnham Coastguard said: "This bottle still looks almost new - it's shocking how long rubbish can survive." Marked 4d off, the bottle dates back to before decimalisation in Britain in 1971. "There was about 300 to 400 tonnes of stuff that had been washed up overnight," said Dave Welland, coastguard station officer. More than eight million tonnes of plastic enter the world's oceans each year. The damage to marine wildlife was highlighted on the BBC's Blue Planet II, which helped to provoke a range of measures from the government and community groups.